In 1961, newly elected United States President John F. Kennedy sent the first 100 military advisors and a special unit of 400 soldiers to Vietnam. The following year the United States increased their troops in Vietnam to 11,000 soldiers. In March 1965, the US Air Force started Operation Rolling Thunder, the wide-scale American bombardment of North Vietnam. At the peak of the Vietnam War, in 1968, the United States had about half a million soldiers in Vietnam. 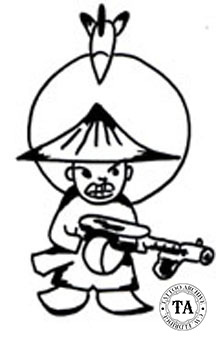 The National Liberation Front under communist leadership, (nicknamed Viet Cong by the US), opposed this contingent with 400,000 troops. The carpet bombardments of North Vietnam ended in October 1968 and the United States began withdrawing troops from Vietnam. On January 27, 1973, a cease-fire agreement was signed in Paris becoming effective that day. In March 1973 the last American troops left Vietnam. The illustration to the left is by Tom Pellettiere. The Vietnam War was very unpopular with the American people. As a result, it offered artists of all types opportunities to slander the Vietnamese with many unflattering images. 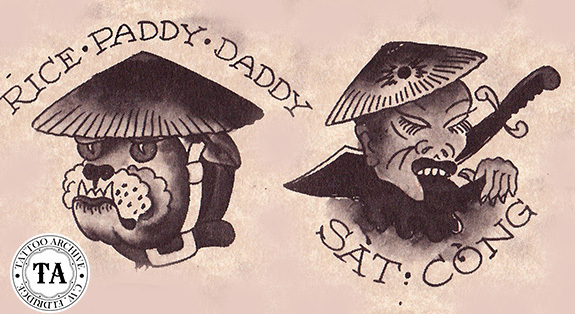 Tattoo artist Sailor Jerry Collins was skillful at the cartoon style put-downs, creating a whole sheet of "Cong" designs in 1967, from the "Rice Paddy Daddy" to "Dead Cong - Good Cong." Many of these designs and slogans were simple reworks of politically incorrect images from other wars. In World War II, for example a popular slogan was, "The Only Good Jap is a Dead Jap."